The new, 'James Bond-style' assassination is the new face of crime on Mexico's Pacific Coast, where cartel killers are murdering gang rivals in tourist areas - and escape from the beach on high powered jet skis to get away from police. 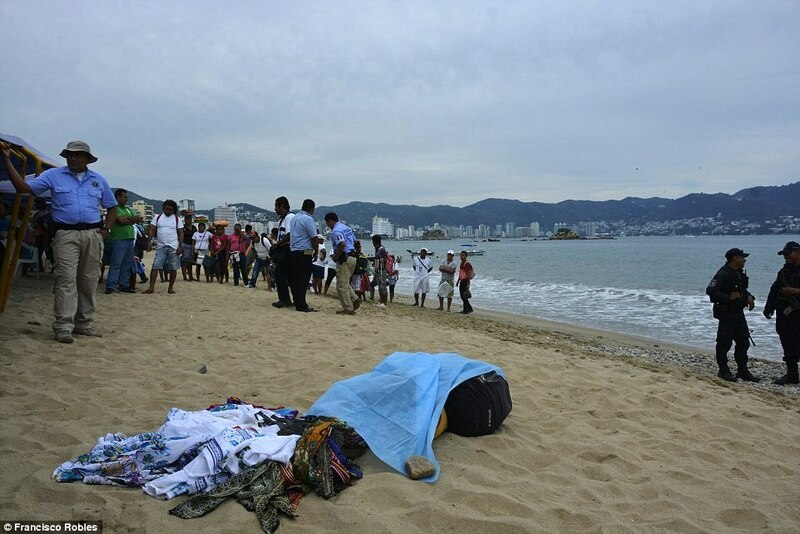 The latest such execution in broad daylight is the fourth to hit Acapulco this year. Acapulco is in the midst of its worst crime wave for a decade where there were 1,600 murders last year and already 684 in 2016 - or 12 a day. Beachwear vendor Eduardo García, 46, bled out on the beach as the crowd and his family waited on the police to arrive on the scene. The Mexican police did not arrive for 70 minutes after the incident even though the police station was relatively close to crime scene. His family arrived at the scene before the police even though their home is 10 times farther from the murder scene than is the police station. Eduardo died in the arms of his family while they waited for help. The jet-ski murder, which occurred on January 29 in early afternoon, is the fourth of its kind to see killers escape from Acapulco Bay to another part of Guerrero state’s jagged Pacific coastline. The killers who left the salesman dead on the beach in front of hundreds of onlookers have still not been caught, the case buried under the unceasing daily onslaught of crime. After the attack Eduardo García, 46, bled out on the same golden sand he had walked for 25 years selling clothing. The terrified tourists gathered around bloodied corpse and waited over an hour for the authorities to arrive. 70 minutes after the murder, a police boat traced the criminals’ escape route for any trace of the killers, but all in vain. ‘It was over so quickly, and I'm not just talking about the killing,’ Jaime Mendez, who manages the beach furniture rentals where the crime took place, told MailOnline. Hoping to make 150 pesos (£6) a day selling clothing to the dwindling tourists, the beach salesmen are forced to give 15 per cent of their earnings to the gangsters who control the beach. Not paying up means death. ‘Perhaps Eduardo wasn’t paying his dues, or perhaps he was selling drugs on the side, or maybe one of his brothers is a gangster and a rival cartel is making his family suffer,’ he told MailOnline. *See the Daily Mail article for images of the incident, map, and a short 1:03 minute video. Who: Eduardo García, 46, who had worked for twenty-five years as a clothing salesman to tourists along the Acapulco Bay beachfront. What: Two sicarios (assassins) on a jet ski—an operator and a shooter—engage in a targeted killing of a clothing salesman in a beach front tourist area. The shooter got off the jet ski, swam to shore, and with a 9mm pistol put three rounds into the clothing salesman’s chest which subsequently killed him. The shooter then swam back to the jet ski and the pair of sicarios made their escape along the rocky coastline towards either Playa Tlacopanocha or Playa Manzanillo. The Mexican police did not arrive for an hour after the incident even though the police station was relatively close to crime scene. A police boat called in to locate the fleeing sicarios arrived seventy minutes after the shooting and was unable to locate them. When: The early afternoon of Friday 29 January 2016. Where: Along the beachfront of Acapulco Bay—La Avenida Costera Miguel Alemán —by Playa Condesa in the tourist area in the state of Guerrero, Mexico along the Pacific coastline. Why: The incident appears related to the ongoing street taxation of beach vendors in Acapulco by local criminal gangs. 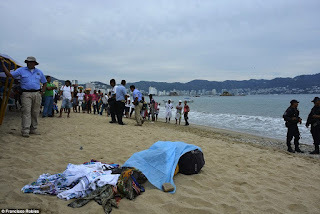 Analysis: Information related to the motivation behind this targeted killing of a beach front clothing salesmen in the tourist district of the Acapulco beach front is fragmentary at best. It is apparently the fourth incident involving sicario use of jet skis for a targeted killing in Acapulco  and suggests that it may be related to ongoing patterns of street taxation (e.g. extortion) by local gangs and organized criminal groups against street vendors and local businesses. The brazenness of the killing is likely meant to send a message to the other individuals and groups being extorted to either pay their monthly 15% tax to the local criminals or face the consequences. Contextually, it should be noted that the jet ski related killings have taken place during a long period of rampant crime and a high level of homicides gripping Acapulco; averaging out to 12 per day or about 650 so far this year . Acapulco is in the midst of its worst crime wave for a decade. A large spate of murders in mid-February was blamed on Pope Francis' five-day visit to Mexico, when the majority of the military and federal police forces that normally guard the city, were removed to ensure the pontiff's safety. More than 100 murders took place in Acapulco during those five days - and the town's municipal police force was left in charge. 'Ironically, there was a lot of blood while the pope was here talking about putting an end to it,' said Fransisco Robles, a local crime reporter who spends his evenings following the police radios to the latest crime scenes. 'It may look like paradise, but this place is hell,' says beach furniture rental manager Jaime, who came to Acapulco from Mexico City three years ago looking for a change of scene. After nearly a month Eduardo's jet-ski killers remain on the loose, his family forgotten who held their dead father in their arms forgotten, and the brutal daily average of four homicides has rumbled on unabated. Arturo Martinez from Iguala, where 43 students went missing at the hands of local police in 2014, had unwittingly allowed his brother to bury him in sand on the same spot where Eduardo had been gunned down a month before. 'After that, about 20 per cent of murder victims simply get killed in the crossfire, wrong place at the wrong time stuff,' he told MailOnline. Despite a recent fall in tourism, millions of holidaymakers still jet off to Acapulco's idyllic shores every year. With hotels costing around £35 a night, and a two course meal with a glass of wine costing as little as £15, it was once the prime destination for Americans looking for a cheap break away. But far from its beaches lined with holidaymakers on sunbeds, many of Acapulco's poorer residents have been forced to make their homes on the other side of the hills, in sprawling slums that have become loosely known as the 'Periphery'. It's here, in the Acapulco the tourists don't see, that the majority of the violence occurs. 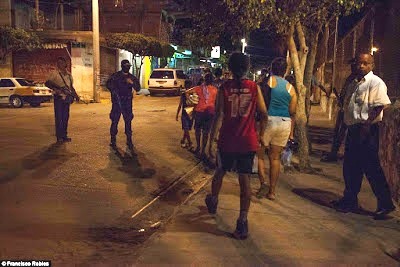 Jimena Gomez, 17, who lives in the Periphery slums, told MailOnline of the violence she witnesses on a daily basis. 'I sleep right through the gunfire these days and have learned to look away when I see a murder happening in the street,' she said standing outside her house that overlooks the Periphery. While the security presence along Acapulco's beach is heavy, government forces in the Periphery are minimal. primary schools to prevent the kidnap of students and teachers, a business which saw a surge when the drug cartels got hold of public school salary lists. The phenomenon of kidnapping teachers came to a head five years ago when local criminal cartels began abducting the highest earners, demanding many year's worth of payment in exchange for their safe return. One teacher who was kidnapped in 2015 alongside her daughter from the Carlos Carrillo Primary School in the Periphery fled Acapulco immediately following her £10,000 release, vowing never to return. Since the death of the 'Boss of Bosses' Arturo Beltran-Leyva, and the subsequent break-up of his Beltran Leyva Cartel which once controlled the whole of south-west Mexico, Acapulco has been fought over by the CIDA (Independent Cartel of Acapulco) and the Devil's Command (AKA Barredora) cartels. Acapulco is a valuable territory for organised crime. Guerrero state is the country's largest producer of raw opium and the majority of this, as well as the refined heroin into which it is made, arrives in southwest Mexico's largest port city before it is sent northwards to be sold to other cartels, who move the narcotics into the US. Coupled with the local drug and extortion rackets that the tourism industry lends itself to, Acapulco has become southwest Mexico's most profitable cartel territory, and the brutality of the gang wars has come to reflect this. 'In regions controlled by a single cartel you'll generally see less brutality, but given the war for dominance in Acapulco the killers have to send a messages every time they murder,' says Francisco. 'I never go further than 100 yards from my hotel, but now it seems even the beach isn't safe from the violence,' said Bryna Freidman from Toronto, 64, who says she has noticed a large drop in visitors to the Pacific resort over the 35 years she's been an Acapulco regular. And for those die-hard Acapulco holidaymakers like Bryna, the toll that Acapulco's cartel war has taken on the city no longer justifies the thousands of dollars she pays to come here for her holidays. Alasdair Baverstock, “EXCLUSIVE Bloodbath on the beaches: The Mexican drug gangs riding on JET SKIS to blast victims in ‘James Bond-style’ executions in Acapulco where 12 murders take place every day.” Daily Mail. 26 February 2016, http://www.dailymail.co.uk/news/article-3464121/Now-Mexico-drugs-...-James-Bond-style-execution-Acapulco-12-murders-DAY-648-year.html. Al Henkel and Elizabeth Chuck, “Cartels, Smugglers at Work: A Night on the U.S.-Mexico Border.”NBC News. 16 July 2014, http://www.nbcnews.com/storyline/immigration-border-crisis/cartels-smugglers-work-night-u-s-mexico-border-n157426. Michael Sanchez, “Maritime Security: Fact or Fallacy? The View from Gibraltar.” CIMSEC. 19 November 2015, http://cimsec.org/maritime-security-fact-fallacy-view-gibraltar/19555. Rohan Gunaratna, “Maritime Terrorism: Future Threats and Responses.” Briefing to the International Research Group on Political Violence and Terrorism, Washington, DC., May 2001 and Gunaratna, “Suicide Terrorism in Sri Lanka and India,” p. 1. Cited by Bruce Hoffman, Inside Terrorism. New York: Columbia University Press, 2006, p. 331, Note 76. See the image of the captured and shot up jet ski at the Clandestine Immigration and Naval Museum, Haifa and the description in Hebrew related to it. Posted 08/03/2011 athttp://k38watersafety.com/forum/showthread.php?t=2964. Christian Gysin et al, “Horror on the beach: At least 15 Britons confirmed dead in Tunisian massacre as it emerges that ISIS gunman LAUGHED as he picked off his victims.” Daily Mail. 27 June 2015,http://www.dailymail.co.uk/news/article-3140454/Tourists-run-lives-Tunisian-beach-gunman-carries-attack-outside-hotel-packed-Britons.html. CACAPULCO HAS BEEN STEALING TOO MUCH BUSINESS FROM CANCUN. The gringo tourists with the money belts and suntan lotion have to shoulder blame--turning your eyes away from my Mexico and the effects willnot work. Also it should be noted that young women are being assinated in broad day light. Furthermore, there is the possibility that the man that was selling t-shirts on the beach was killed by other venders that own permanent shops. The guy does not pay rent, power ect..or the same amount of taxes as someone who has a shop. I'm sure they do pay rent to municipals or a business licence which is usually more expensive in tourist towns plus cartel tax or all of Acapulco would be on that beach and tourists chased away from harrassment and there's probably a quota of how many are permitted as well. Actually there is no quota of beach vendors. The Gov. doesn't even have a count on how many there are. And most do not have licenses. I thought taxi drivers getting killed was more not paying extortion fees? You wish,the troll under the bridge,im miss lonely. I used to come here to see how particular pary of Mexico is doing. It's bad all over the world but in Mexico I think at this moment is the worst. I don't know the guy or his family but look at his attire and his occupation. What it cost to kill him he probably never made that in a month. Don't kid yourself.Tourists buy on vacation.Maybe he did make a good living but probably seasonal except for Chilangos in summer who probably wouldn't buy many blankets or silver from Taxco. Canna, i'm watching Charlie Wilson's War, right now, they are trying to get the israelis to sell russian weapons to the Afghan rebels for US dollars, to fight the russians, and something made me wonder, have you ever been a belly dancer? "'I never go further than 100 yards from my hotel, but now it seems even the beach isn't safe from the violence,' said Bryna Freidman from Toronto, 64"
Could be time to change holiday destination... Just saying. 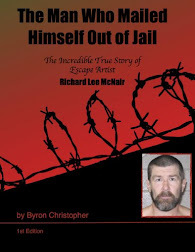 How did the killer swim to shore with the pistol? Wouldn't it get wet and not function? @12:51. Simply put in in a waterproof pouch and tape it or strap it to his body. Most modern pistols will work after getting wet. Glocks function fine when wet. Not saying that was the gun he used but I'm speaking from experience. This is so dumb. This is why mexico keeps getting worse. Even the organized crime in mexico is ran by a bunch of idiots. You can't make any money extorting local businesses if you keep driving all the tourist away with all this violence. I can get one night at a 5 star room with a view of the ocean for the same price as a 1 star roachmotel in the states. Ridiculous.